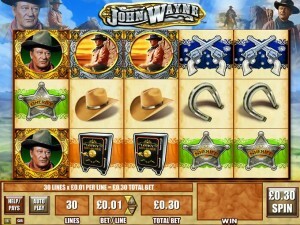 John Wayne is the name of this slot machine, a WMS creation whose theme should need no introduction. Inspired by the actor with the same stage name, it’s a Western themed game, the same as many of the movies in which he played. For decades, this actor dominated the box office with his movies, and managed in the process to also become a true symbol for American males, a rugged and masculine character that gave many something to aspire to. 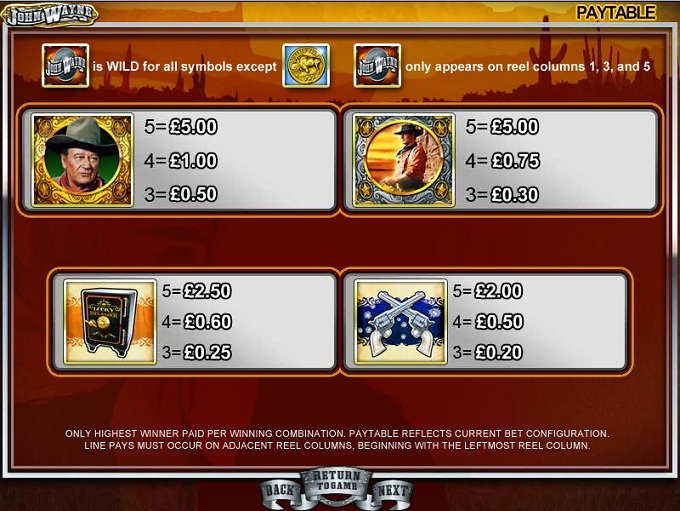 This WMS slot is a 5 reel title, with a fixed number of 30 paylines in use each round. You will get from it free games, a lot of scatter symbols, respins and a wild. It has a maximum payout of only $2,500. Two types of symbols with abilities are introduced in the game, one being the wild, the other a scatter. The latter can bring you a feature with up to 50 free spins in it. The wild’s image is that of the John Wayne Logo. Present on the 1st, 3rd and 5th reels, the wild Logo is going to be useful only as a symbol that brings you more wins, by substituting for the symbols which are needed. 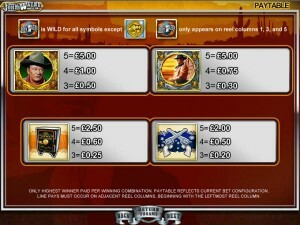 There are no prizes offered directly by it, and no multipliers to apply to the wins, so it’s a very basic wild feature. The Buffalo Coin is the other symbol, the scatter. The game uses a lot more scatters than usual, so you can have up to 15 of them present, taking over all the positions on the reels. That’s in theory at least, as the odds are on the low side for that actually happening. 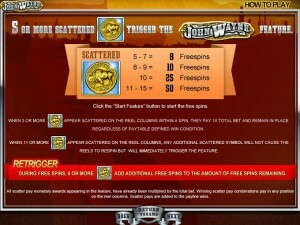 You receive 8 free spins if 5 to 7 scattered Buffalo Coins are on the reels. 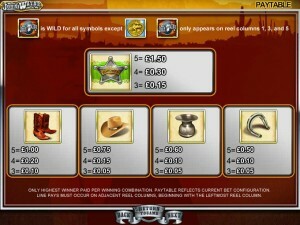 With 8 or 9 symbols, the reward is at 10 free spins. 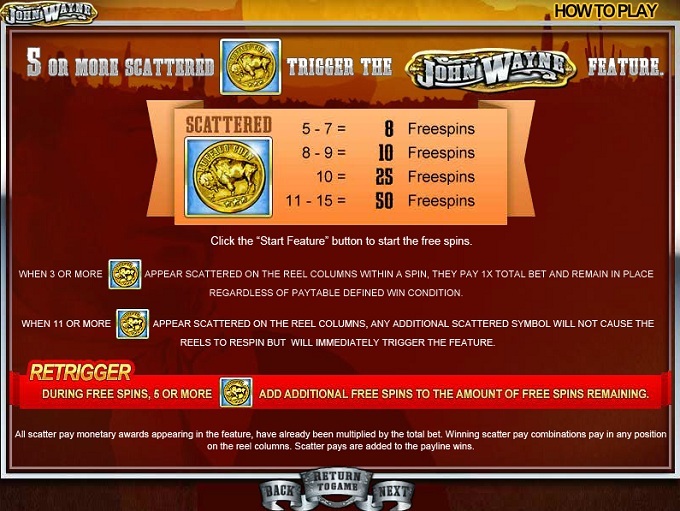 Get 10 scatters, and you move up to a much more serious 25 free spins. Finally, get between 11 and 15 scattered Coins, and your reward will be a total of 50 free spins. Even if you don’t get the 5+ scatters needed to trigger the free spins, you get a second chance to get there if you have at least three of the Buffalo Coins present. A respin is offered in that case, with the scatters being held for the round. Hopefully, this will bring you the missing scatters. As you will notice yourself, the game doesn’t allow you to modify the number of active paylines, always requiring 30 coins to cover them all. You can modify the value of the coins though, the start being at $0.01, while the maximum is $5. You can bet anywhere from $0.30 to $150 each round. The rewards of the game will go as high as 500 coins, which will mean at most $2,500. The game’s Wild West heritage is easily visible. It’s also a John Wayne themed game, so you’re going to see photos of the actor in a couple of symbols and in the logo area. The background image shows off an image of the prairie. Other symbols chosen for the game include things like safes, sheriff badges, horseshoes or hats. Symbols: John Wayne Logo (wild), Buffalo Coin (scatter), John Wayne Close-up (500 coins), John Wayne Riding (500 coins), Safe (250 coins), Six Shooters (200 coins), Sheriff Badge (150 coins), Boots (100 coins), Hat (75 coins), Spit Bucket (60 coins) and Horseshoe (50 coins). I have no doubt that the game will have a lot of fans, the Duke being a hero for many. If you look at just the features and prizes though, it’s not a special slot, not enough to make people that haven’t watched the movies give it a real chance. John Wayne was the stage name of an actor called Marion Mitchell Morrison. He lived between 1907 and 1979, and many consider him to be one of the greatest American actors, especially for the Western genre. He was known mostly as an actor, but he was a producer and director as well along the way. He received the Academy Award for the 1969 movie True Grit and for about thirty years he was one of the most popular actors in the United States. Some of his most famous movies included True Grit, The Searchers, Red River, Stagecoach, Rio Bravo, The Quiet Man and The Shootist. These are only some of his movies though, the actor playing in 142 different ones during his long career. 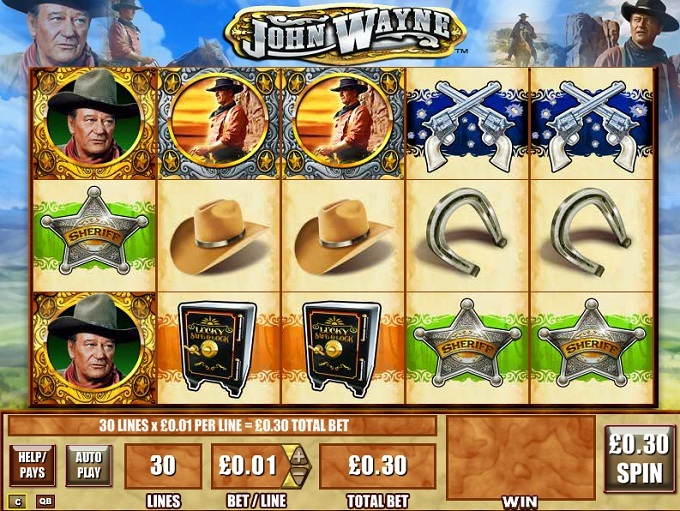 You will find John Wayne at any online casino which chooses to use software from WMS, playable either for free or for real money.